I was at the mall last week and I stopped by the sporting goods store to get some advice about running shoes. I spoke with a very convincing sales guy, and an hour later, I walked out of the store with a new pair of shoes! What, how did that happen?! A few minutes later, my friend's advice was ringing in my ears: Buy your sneakers from an actual running store. Oh crap. There you have it, I got hit with shopper's remorse! I told myself that I can give the shoes a try on the treadmill and if they don't work out, I can always return them. 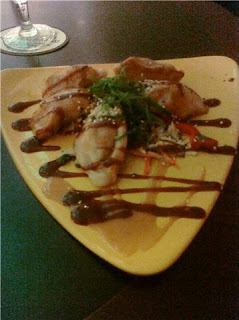 I wanted to grab a quick bite post-shopping, so I went to Gordon Biersch Brewery and ordered potstickers. What I got were soggy dough balls. The golden brown colour of the potstickers was misleading because they were not at all crispy. The gumminess of the shell was apparent at first bite. No crunch, nothing. Note to chef: Please don't oversauce the plate and let it sit. At least the ample amount of shrimp and chicken filling was nicely seasoned, with familiar Asian flavours of ginger and green onion. Speaking of, I guess ordering anything "Asian" means that it will be covered in black and white sesame seeds. I am so disappointed in the actual food, I'm not even going to fault the place for the 1980's-style presentation. Doing so would be kicking the restaurant in the shins while down. When I got home, I did some online research of my shoes and turns out they've been rated very well in running magazines and runners forums. I tried them out on the treadmill and passed Mile 3 without any shin splints! Success! I guess I won't be returning them after all. If only I could say the same for my lunch experience at Gordon Biersch Brewery. That'll be 40 minutes of my life I won't ever get back!